The new design will replace the moose-and-mountain design adopted in 2010 by the Bureau of Motor Vehicles, which is overseen by the secretary of state’s office. That design features an outline of the state of Maine, a white pine cone (state tree), a tassel (state flower) and a black-capped chickadee (state bird), as well as iconic state imagery, including a potato field, lighthouse, sailboat, mountain and sunrise. “Our staff has worked diligently to create a design that elegantly incorporates a variety of images that speak to the Maine experience, while also improving the security of these important identity documents,” Secretary of State Matthew Dunlap said in a statement. The new design also includes features to make it more difficult to produce fraudulent identification or driver’s licenses, while making it easier to recognize counterfeit documentation, according to Dunlap’s office. It will be issued to all applicants upon their next renewal. 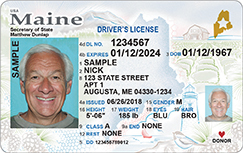 Among the new design elements is a golden-colored Maine with a white star within it, in the upper right corner, that signal the identification is compliant with the federal Real ID Act. Maine is among 11 states and two U.S. territories technically not compliant with Real ID but that have been granted additional time to meet its requirements, according to the U.S. Department of Homeland Security. The remaining states have been certified as compliant by Homeland Security. The penalties for not complying are potentially high. Travelers who want to board domestic flights must present compliant identification starting Oct. 1, 2020, and those with noncompliant identification will need to use an accepted alternative, such as a U.S. passport or passport card, to fly across the country or to enter certain secure federal facilities, such as military bases, nuclear plants or the U.S. mint. In the coming weeks, the Transportation Security Administration will start posting signs at airports across the country to remind travelers about Real ID compliance. Real ID emerged in 2005 among a slew of legislation to address national security concerns after the Sept. 11, 2001, terrorist attacks, and it was one of the key recommendations in the 9/11 Commission Report. The Real ID Act set national standards to improve the security of state-issued identification to prevent undocumented immigrants and terrorists from obtaining U.S. driver’s licenses. Several of the 9/11 hijackers had obtained state-issued driver’s licenses in the months leading up to the attacks. Those requirements include using facial recognition software at Bureau of Motor Vehicles offices, fingerprinting Bureau of Motor Vehicles employees and Homeland Security-approved security markings on ID cards, among other standards. The state’s protest reached a dramatic point in October 2016, when Homeland Security denied Maine’s request for a renewal of its waiver from Real ID enforcement over its continued noncompliance. That left Maine residents subject to enforcement after Jan. 30, 2017, when the federal government stopped accepting Maine driver’s licenses as valid identification for entering military bases. It set off a legislative debate that ended in April 2017 with the passage of a bill, LD 306, to grant Dunlap the authority to bring the state into compliance. That law gives Dunlap’s office until July 1, 2019, to meet the requirements of Real ID. In October 2018, Homeland Security granted Maine a waiver from Real ID compliance as the state took steps to meet the law’s requirements. Kristen Muszynski, a spokeswoman for Dunlap, said in an email Monday morning that the state is on track to meet that July deadline, when the Bureau of Motor Vehicles will begin issuing compliant identification. Mainers can choose to opt out of Real ID and receive a non-compliant identification that will resemble the new design without the golden-colored Maine and white star. Anyone whose driver’s license or identification expires after Real ID enforcement begins in October 2020 will need to renew their documentation to be in compliance or use an accepted alternative for domestic air travel or other federal purposes, according to Muszynski.